I started my day with two slices of my soaked bread, slathered with grass-fed, cultured butter, and raw local honey. Does it get any better than that? I should have had some raw milk, but I was too full! Besides cleaning, packing, and school lessons, I've been trying to use all of the fresh food in my fridge or get it frozen or preserved. I made a batch of simple sauerkraut. It took about 10 minutes, including the time it took to get enough whey from some kefir. The recipe couldn't be easier, and it will be ready to be transferred to the fridge when I get back from my sisters. Here's how I did it. Put all ingredients in a bowl. Mix. Mash with the mallet until the juices start to form. Nourishing Traditions recommends 10 minutes. It will vary based on the shred size. You want a good amount of juice. Transfer the cabbage and all of the juices to the jar. Mash it down as much as you can. The goal is to have all of the cabbage fully submerged in the liquid. Glass and metal aren't optimum, but this is what I have. 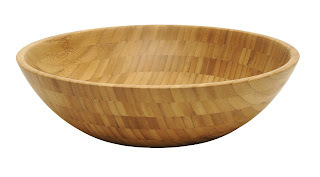 I would love a bowl like this. 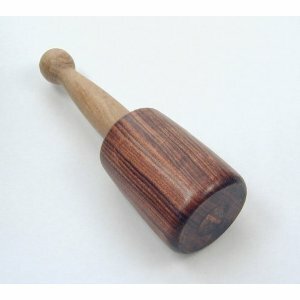 And a mallet like this! Here's my easy way to make whey...that makes me giggle a little...I'm such an English nerd! I take a simple 49 cent dish towel from Ikea, a plastic pitcher, and a stainless steel colander. My contraption looks like this. I'm sure if you dig through your cabinets you can find something to use. Very quickly there is enough whey to use for the kraut. Then I hang it like this. You are waiting for the the kefir (or yogurt) to be the consistency of cream cheese. Then remove it from the towel, and put your extra whey in the fridge. Whey will store for months and it is useful for fermenting veggies and sauces (like ketchup), soaking beans and grains, and adding protein to smoothies or salad dressings. The possibilities are endless, so if you are hesitant, thinking you won't use it...trust me you will! Oh! The cheese, I almost forgot. My favorite way to eat the kefir (or yogurt) cheese is on bread. I mix it with just enough Grade B Maple Syrup to cut the sourness and add some chopped walnuts and spread it on THICK!! It would also be good on sliced apples. If your new to the idea of fermenting take a second to read the notes from the talk I gave at my last local Weston Price chapter meeting. I know fermenting sounds so hard...but once you start working it into your routine, the easier it gets. I have Ikea towels somewhere in this house that would be perfect! I want to make mayo so badly! I need to go through boxes! Those towels really are the best thing I've used. You will like making mayo, it isn't as hard as it sounds, and you can tweak it to just the tang/creamy taste you want.